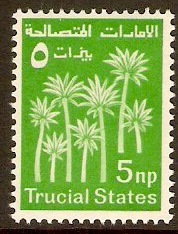 Trucial States 1961 5n.p Green. SG1. Mounted mint 1961 5n.p Green. SG1. 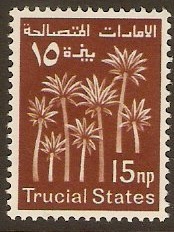 Trucial States 1961 15n.p Red-brown. SG2. Mounted mint 1961 15n.p Red-brown. SG2. 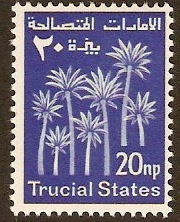 Trucial States 1961 20n.p Bright blue. SG3. Mounted mint 1961 20n.p Bright blue. SG3. 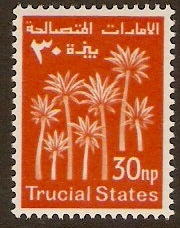 Trucial States 1961 30n.p Orange-red. SG4. Mounted mint 1961 30n.p Orange-red. SG4. 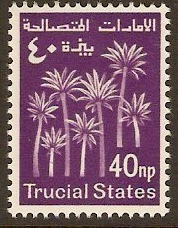 Trucial States 1961 40n.p Reddish violet. SG5. Mounted mint 1961 40n.p Reddish violet. SG5. 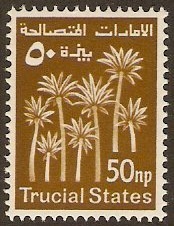 Trucial States 1961 50n.p Bistre. SG6. Mounted mint 1961 50n.p Bistre. SG6. 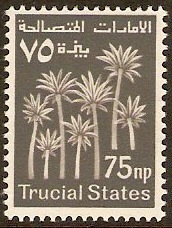 Trucial States 1961 75n.p Grey. SG7. Mounted mint 1961 75n.p Grey. SG7. 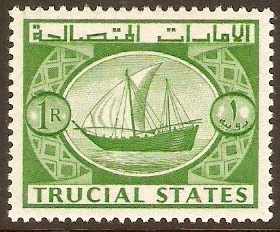 Trucial States 1961 1r Green. SG8. Mounted mint 1961 1r Green. SG8. 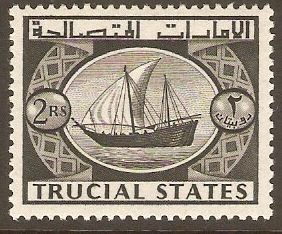 Trucial States 1961 2r Black. SG9. Mounted mint 1961 2r Black. SG9. 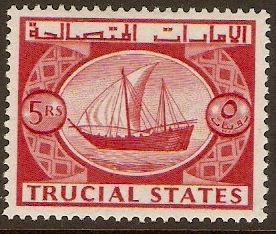 Trucial States 1961 5r Carmine-red. SG10. Mounted mint 1961 5r Carmine-red. SG10.